I feel like I am always mentioning the indoor brew setup, but never acting on it. Well I got a little bit of time off (Not a fan of calendar year based leave and use/it lose it) at the end of 2014 and decided to really brainstorm what I want and how it will work in my tiny space - Over-analyzing and researching...typical!. I printed out some graph paper and got to work measuring and drawing things out. I have always been a fan of using dimensional 2x3 for projects whenever possible (used it for the shelving shown in the pics below below). For most applications 2x4s are overkill and since space is somewhat tight I plan to use 2x3's for my brewstand to save a few inches. Below is the scanned drawing. I tried to get things pretty accurate, and while I acknowledging I am a horrible artist, I think it came out pretty well. My Microsoft paint skills on the other hand...not so hot. Small Footprint - I want it to be no larger than a 2' square. This should be 20"x23"
Gravity Fed - With the kettle ball valve approximately 21" I can just drain into my better bottles (which are 20" tall). Mash tun gravity fed to kettle just like I do in my typical setup. Wood - I definitely understand why a lot of people choose metal for their brewstand, but I prefer wood for aesthetics, cost, and because I have the tools to work with it. 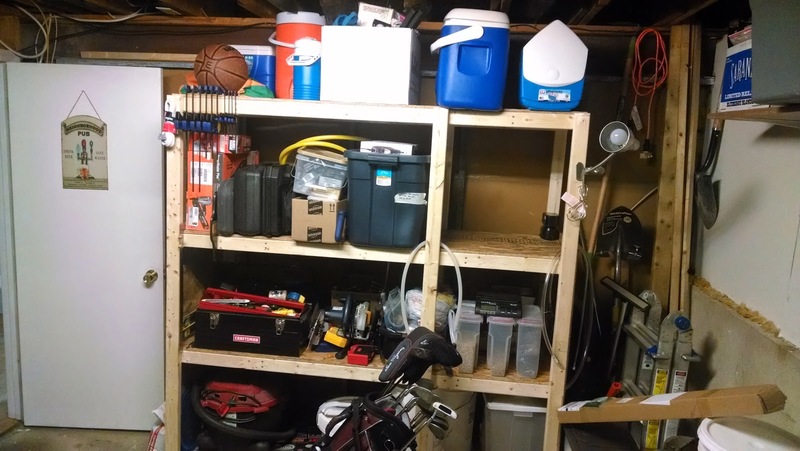 I don't have an outdoor storage shed yet, so I have a lot of tools scattered around the tiny unfinished area of my basement. This area acts a whole-house storage and brewery. 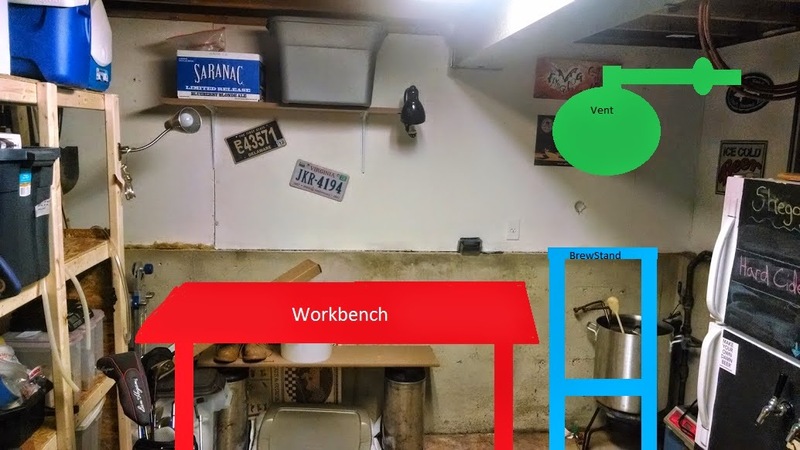 I am in desperate need of a workbench for standard household projects and it will also get a lot of use during brewday once it is all setup. 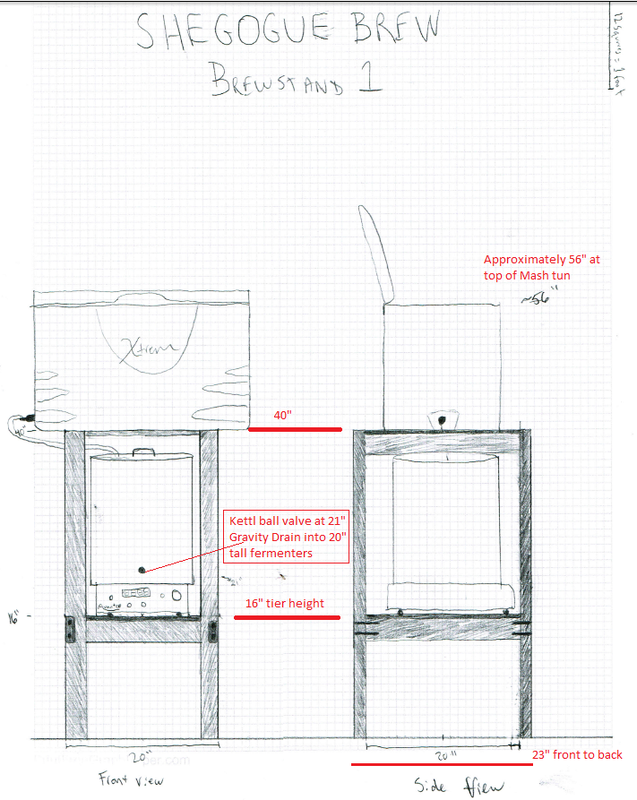 The bench will most likely take on the functions of a weighing table, racking table, and yeast starter table. The last picture is of my my kegerator and fermentation chamber. Oh, you noticed how ugly my fermentation chamber is did you? You're not alone, Mrs. Shegogue often comments on the lack of visual appeal and constantly asks "I thought you said you were going to get a new one which is smaller and more appealing." Eh, it works so why fix it? I just recently added the shelf to house my glassware and find it really handy as I don't have to run upstairs for a glass when I want to sample some fine brew. 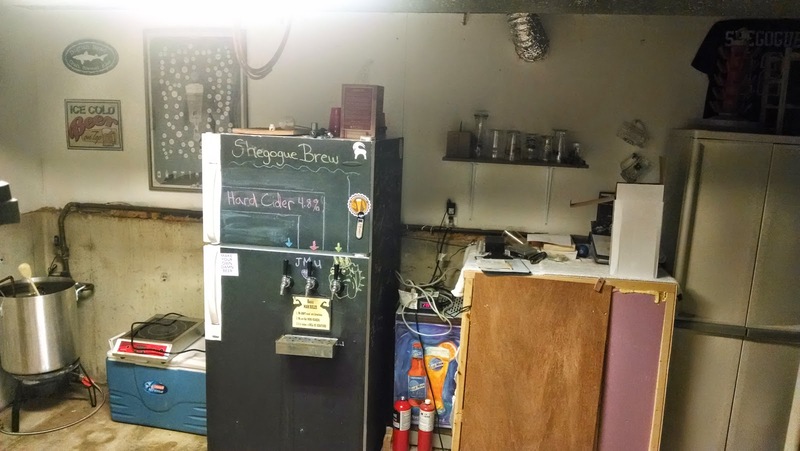 So there you have it, the current state of the Shegogue Brew, brew house. I am still a ways out, but at least we are making some sort of progress rather than just talking about it!